TRU welcomes its third chancellor since introducing the role back in 2004. Simpcw Chief Nathan Matthew will fill the position starting in March. The announcement was made on Feb. 2 in the Mountain Room by Jim Thomson, the board chair for TRU’s Board of Governors. Thomson introduced Matthew to the crowd as a great asset for the university and the perfect fit for the position. “He’s a leader in local, provincial and national circles for his advocacy for quality Aboriginal education. Nathan was TRU’s first executive director of Aboriginal Education from 2006 to 2014. His service with community and education span more than three decades and for this has been recognized multiple times,” Thomson said. Matthew is chief of the Simpcw First Nation of Chu Chua near Barriere, a position he has held for more than 20 years. In addition to being TRU’s first executive director of aboriginal education, TRU awarded Matthew with an honorary doctorate of letters in 2006. In addition to his work with TRU, Matthew been a member of the Assembly of First Nations Chiefs Committee on Education and an education consultant throughout B.C. occur during convocation ceremonies on June 6. 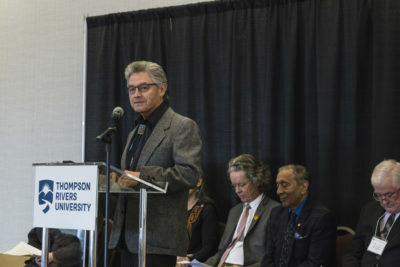 The Thompson Rivers University Act states that chancellors serve three-year terms and will serve no more than six-years. Wally Oppal, the university’s current chancellor, has held the position for over seven years since 2010. Oppal’s term was extended to allow for the search of TRU’s next chancellor. Oppal was a retired B.C. Supreme Court justice who succeeded TRU’s first chancellor, Sen. Nancy Greene Raine, who held the position from 2004 to 2010. The role of a university chancellor is to serve as a member on both the school’s board of governors and senate. The chancellor also presides at convocation and confers all degrees. Matthew said that he was happy to accept this volunteer position and he hopes to bring his experience of Aboriginal education and inclusion to the table.